1. Josie Maran Argan Cleansing Oil - How many times do we have to go over this? Cleansing OILS are not bad people - they are good. In fact, they have changed my skin remarkably. And for all you science buffs out there - oil binds to oil, correct? Exactly why this is the perfect cleanser for oily skin. This particular one is thicker than I have used in the past, which makes you work a little more to scrub off the makeup. However, the result is ridiculously clean skin and not a trace of makeup. Nothing. This stuff should be used to clean crime scenes. 2. Amore Pacific Treatment Toner - Toner Schmoner. This was my mantra for so long - until I happened upon this product. I find after using this toner, my skin feels much smoother and calmer, and I am convinced it has helped manage my oil production. I find on the nights that I use this - the following morning my skin is less oily and more even tone. I can officially say I am now on the toner bandwagon. 3. 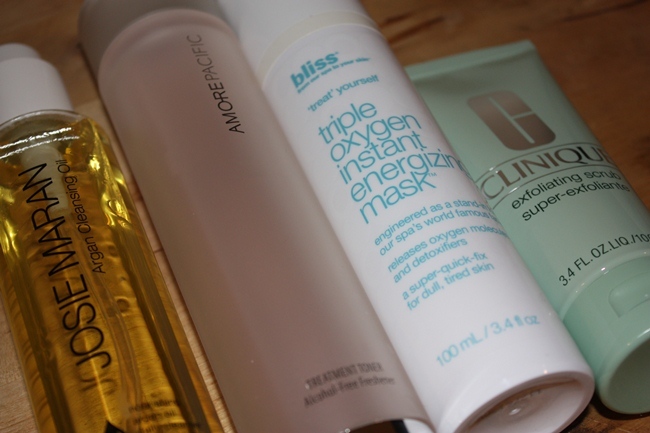 Bliss Triple Oxygen Instant Energizing Mask - I sang this mask's praises on my post for ThisThatBeauty, and we are still going strong. Simply amazing. And the best part is it foams up and looks like a fluffy, bubble bath on your face. Yes - it's delightful, trust me. When you rinse it off however, the true magic happens because your face is hydrated, plump and glowing. You should not be getting ready for a special night out without this mask. Your fabulous outfit will thank me. 4. Clinique Exfoliating Scrub - If I could exfoliate my face 10 times a day, I would. I love the feeling of freshly scrubbed skin, but I realize that my skin needs an outer layer, so I manage to reign in my tendencies. I appreciate this scrub because it has a minty scent that even after the scrubbing is over, still leaves my skin tingling and feeling ridiculously fresh. 5. Mario Badescu Drying Lotion - This stuff should be renamed the "Pimple Police". It fights blemishes with such vengeance - and for its service I am truly grateful. Little tip - do not shake the bottle no matter how tempted you are, simply dab the Q-tip in all the way down to the pink sediment and then spot treat away. Precaution: do not apply before you take out your dog for his last nightly walk. People can see this on your face, and people will stare at you. 6. Kiehls Ultra Facial Cream - Sometimes I just want a basic skincare cream - no bells, no whistles, no change-the-course-of-my-life-with-a-single-drop claims. No muss, no fuss. This is why I have kept this cream in my skincare arsenal for so many years, along with its sister the SPF 15 lotion. Hydration is the best key to keeping skin looking its best, and this Ultra Facial range is the expert. 7. 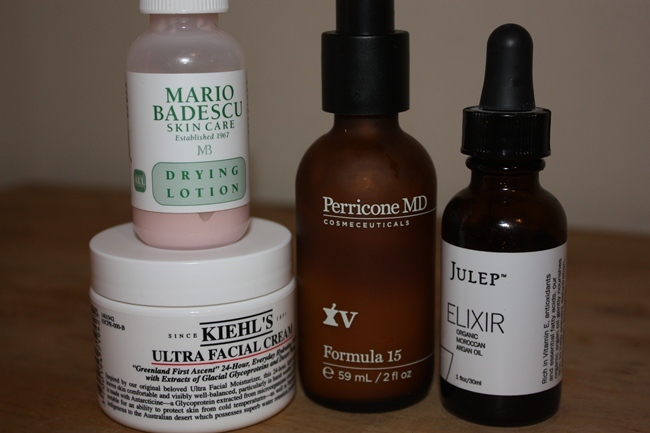 Dr. Perricone Formula 15 (c/o) - As a regular contributor to the Daily Perricone blog (oh you didn't know? yes I am, but I don't like to brag. *blink, blink* *blushing*), I have had the opportunity to try this cult-classic. Always wary of beauty hype, I often tread cautiously - however my tread turned into a full gallop of joy after using this product. Used to help correct skin imperfections and improve overall skin's appearance - check. Perfect for day or night, under makeup or alone - check. Total worthy of its cult status - check, check, check! 8. Julep Elixir Organic Moroccan Argan Oil - This product can be used to do everything but fix the kitchen sink (though I haven't tried, so it's possible). I have used it on my face, my cuticles, my hair, my body - it is my cure all for giving my skin intense nourishment. Though I have oily skin, I have never been scared of oil on my skin and find my body seems to get the memo and chill out on overproducing it. It's my reverse psychology trick I play on my skin. How brilliantly manipulative of me. Now that I have given you my nightly run-down, I think it's time you share yours. What products are you loving that I am missing? I want to be included. Drop me a comment below or tweet me @alittlebitetc and tell me what I am missing out on. I can be persuaded very easily. Great post. Loving seeing what skincare people use. I nominated you for the Laine Blogger Award. If you don't want to do the post thats fine. I know they can be annoying sometimes but did want to give you a mention at least. Thanks so much Meredith! You are so sweet! I am so crazy with writing for ThisThatBeauty and Dr. Perricone - I am not sure if I will have time - eek! But I always appreciate the support so much! I really like the sounds of the Perricone oil, light enough for day and night, perfection! Great post, Maree! I'm suddenly considering this Bliss Triple Oxygen mask...is it really worth the $54? And do you apply a face cream after to moisturize and hydrate the skin?